We wish you all a very Happy Easter as term 4 draws to a close. Thank you to the pupils for working so hard this term. We have seen some excellent reports with pupils making fantastic progress from the beginning of the academic year. The pupils have worked really hard to achieve and develop their understanding and it really helps when they are supported well at home, so thank you for your guidance and support. We move into SATs exams next term and are confident that the hard work will pay off. Following Mr Pudifoot’s successful surgery and recovery it has been lovely to welcome him back to school this week. He is on a phased return so will be familiarising himself with school matters and liaising with Mrs White to ensure continuity. She remains available during this time and will be able to deal with pastoral matters moving forward. We have been able to remove the posts in the playground and neaten the area with a low climbing wall this term. The pupils are enjoying the play equipment and the opening up of this area. It has been lovely to welcome the Friends of the School for their meeting during the school day. We hope this will allow some parents/carers who struggle with evening childcare to join in with meetings and provide this valuable support to the school. You may have seen the ‘Design a Thank You Card’ competition that FOS have sent home in book bags this week. This will enable FOS to send personalised thank you cards to the many local businesses and individuals who donate in support of the school. Please encourage your child to enter and return their design to the school office by Wednesday 24th April. Spare forms are available in the office. Once again we saw the school filled with a diverse selection of characters. It was great to see the creativity inspired by reading. The popularity of certain books was in evidence alongside less well known novels. A lovely way to demonstrate our love of reading. Staff have attended training related to maths and literacy as well updating knowledge about Asthma and Autism this term. We welcomed Governors into school during the week beginning 11th March. Governors are very involved in the life of the school and visit classrooms and events while the school is in action to ensure that they have a full understanding and can make informed decisions during meetings. Governors were able to help with science activities from looking at fruit to learning about the heart as well as watching inspiring and complex maths and English lessons. In line with their work on the heart Class 5 pupils were able to learn about basic first aid in relation to the heart with a visit from the provider of our school first aid trainer. A really fun, informative and interesting session. Well done to the two pupils who represented Blockley School for the recent ‘Youth Speaks’ competition held in Chipping Campden. They competed against pupils from other local schools and demonstrated Blockley talent very well speaking on the topic ‘If only I could…’. Thank you to all those who entered the competition run by Blockley Amateur Dramatic Company who are performing a play of Alice in Wonderland in St George’s Hall during the Easter holidays. The judges had a hard time to choose the best from a strong field of over 30 entries. After much deliberation, congratulations go to Emma who won the competition with her fantastic entry of the White Rabbit. A close runner up was Alex’s line drawing of the White Rabbit. With so many strong candidates they chose four pictures to have Special Commendations and four further pictures to be displayed in their programme in addition to the winners. The programmes can be obtained on performance nights April 9th– 11th or at the Matinee (2pm) on Thursday 11th April. Tickets for the performance are on sale at Blockley Village Shop. The pupils have been to church this week for an end of term service. This was a less formal event with pupils and staff thinking about Big Questions. With Easter happening at the end of the holidays we will have an Easter themed assembly at the start of term. We are looking forward to seeing the wonderful creations on Friday afternoon as our reception and Key Stage 1 pupils parade their Easter Bonnets around school. A Blockley tradition! Well done to the floorball teams who have been demonstrating Blockley School values and shown great team work throughout the floorball season. Thank you to the parents/carers who have transported them to and from competitions. Class 1 had a brilliant day out at the Black Country Living Museum. They were able to see history come alive and continue the work they started earlier in the year relating to the home. SATs exams take place for Year 2 and Year 6 pupils in May and all are working hard so that they can demonstrate their knowledge and understanding during the tests. Well done for all of the hard work – parents/carers and pupils. We have high aspirations for the pupils to ensure that they strive to be the best that they can while enjoying a well-rounded education. Year 6 SATs take place during the week beginning 13th May and Year 2 SATs take place during the month of May. Plenty of good quality sleep during this time will aid these pupils ability to think clearly and quickly. We all had a very informative and enjoyable day learning about all things Ghanaian. Sprits were lifted with the wonderful display of colourful clothing. 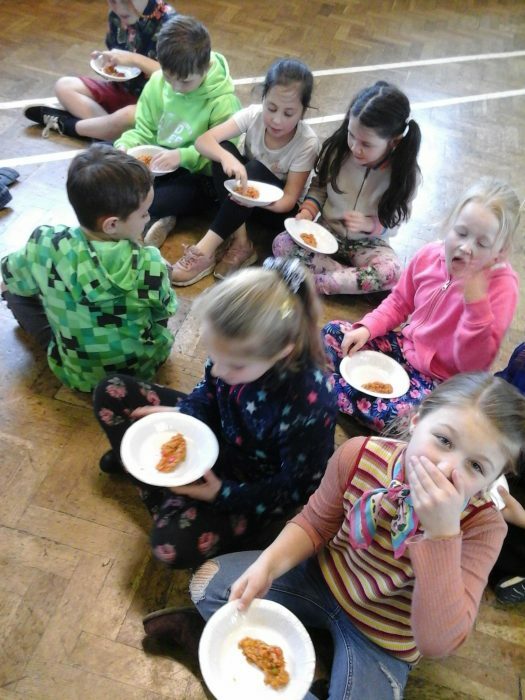 In the afternoon pupils enjoyed a variety of workshops; dance, craft, hair braids and trying Jollof rice. The rice was very popular, especially as it was eaten with our fingers while sitting on the floor. 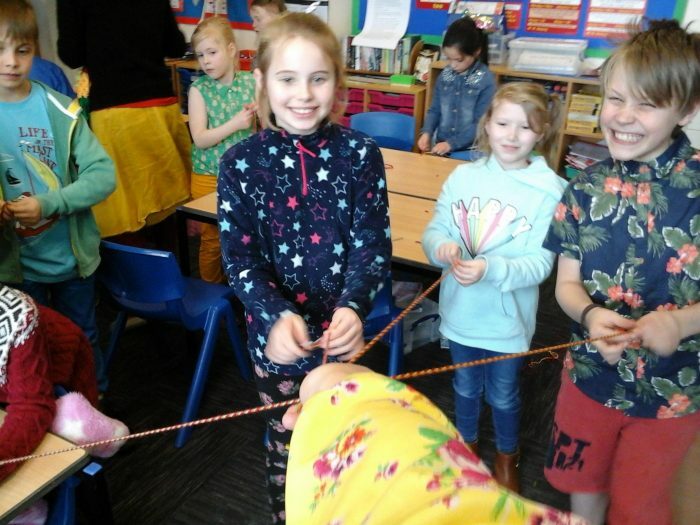 As well as learning about another country and culture the day was also arranged to raise money for metal desks for the pupils at Tishigu School in Ghana. Desks are made locally and cost £30. We managed to raise just over £406 so thank you for your generosity. On Monday, 25th March, Class 3 visited Greystones Farm, Bourton on the Water to take part in an Iron Age Experience Day. The children learnt how people lived in the late Iron Age settlement at Greystones, known as Salmonsbury Camp, 2,000 years ago. After dressing up as Iron Age people, Class 3 spent the morning completing some of the chores people living in the camp would have done. They used a saddle stone and a quern stone for grinding flour for bread and cooked it on the fire in the roundhouse. The children also learnt how to use a fire steel in order to light a fire and thoroughly enjoyed mixing daub with their hands using it to repair a wattle panel to restore the wall of the roundhouse. In the afternoon, children had an opportunity to handle Iron Age and Roman artefacts found on the site and found out how these are used to help us learn more about the past. A fun day was had by all in glorious spring sunshine! Thank you to the 17 children who have entered the competition. We now await to hear how our entrants have fared. The school will be notified of winning entries and any other photographs selected by the judges for exhibition in April. Good luck to our budding young photographers. Congratulations to the Panathlon Games Gold Winners: Blockley School! The event was organised by the charity St James Place. 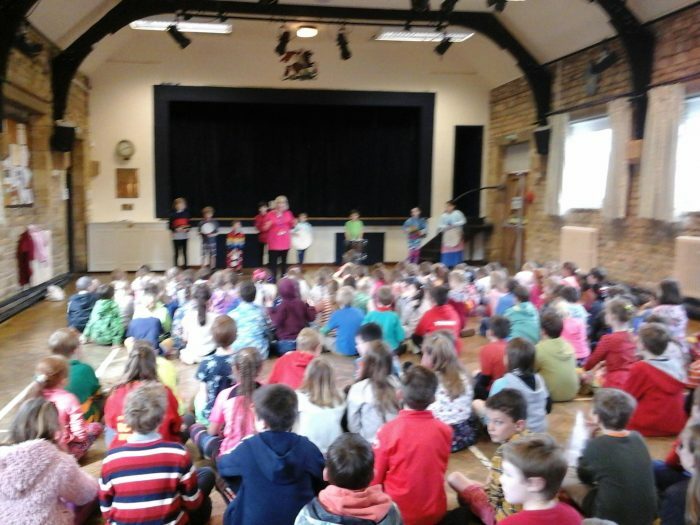 Blockley competed against nine teams from other local primary schools at Chipping Campden Secondary School. The children took part in a range of sporting activities including curling, parachute games, target practice and skittles. The emphasis was on working together to score maximum points for their team. The children performed well together, encouraging and supporting one another. The team consisted of pupils from Year 2 up to Year 5. They will now be invited to take part in the finals in Stroud. We are looking forward to Mr Pudifoot increasing his time in school during Term 5. We are saying goodbye to Mrs Dean and continue to wish Miss Overton-Short, Mr Jones and their son well. We have a number of events to look forward to after Easter. The Dogs Trust are visiting to talk about safety around dogs during the first week back. The winners of the Knex Challenge will attend the next stage of the competition and sharing assemblies take place to which parents/carers are invited. Class 5 will have a leaving event at the end of term 6. We will have ‘service’ as our value in Term 5, remembering those that serve us and how we can serve others. Merit awards will be issued to those who demonstrate service to others while in school. We will look together at how serving others can bring a great deal of personal happiness to those who serve. Finally we wish you all a very Happy Easter. • out of school activities?